I've been shooting with the Olympus OM-D E-M5 for most of 2012 and early 2013. I'm certainly not the first to review it. However, this is one of the more complex products on the mirrorless market and deserved a great deal of actual use and thought before rendering a verdict. One benefit of using the camera for so long before reviewing it is that I'm not infatuated by it as some were in initial reviews; I'm not perplexed by it as others have been in trying to review a highly complex product quickly; and I've come to figuring out my own optimal use of the camera. While the prism "hump" is a bit large and suggests that there might be a built-in flash, there isn't. What we have is the Pen series hot shoe/accessory slot up on top of the area needed for the electronic viewfinder (EVF), and that exaggerates the size of the prism outline a bit. While some have criticized the "big hump", I think it actually lends a bit more of the DSLR-ness to the camera: it absolutely isn't a plain jane mirrorless camera without EVF. The hump says there has to be an EVF on that thing, and there is. You don't have to use the EVF: the E-M5 also sports a tiltable 3" 610k dot OLED display. The OLED part makes it quite usable in bright light, unlike a lot of displays. The 610k dot bit is a bit behind some other LCDs, but I don't find it to be an issue given the clarity of the display. The tilt manages about 80° up and 50° down. That's not as flexible as some, but it's enough to make ground level and over-the-head work easier. Inside the E-M5 Olympus has moved to a Sony sensor. The sensor has been the weak point of previous m4/3 cameras. That was very apparent when the m4/3 Pen models got bracketed by the smaller sensor Nikon 1 and the larger sensor Samsung/Sony APS models: the old m4/3 cameras performed closer to the smaller sensor Nikon 1, which means they were sub-optimal performers. Olympus keeps making "fastest focus" claims with their cameras. The E-M5 is definitely the fastest focusing m4/3 camera Olympus has made, and probably the fastest of the m4/3 cameras in acquiring focus with S-AF (single servo autofocus). This is a system improvement, by the way, not just a single focus component. Lenses have been redesigned for faster contrast movements, the image sensor is running at higher frequency (thus giving more data points to interpret in the same time period), and the focus processing itself has been improved. For static subjects, the focus is indeed something that can be characterized as fast (see performance section, below), but I have to chide Olympus on their constant marketing claims of "fastest." There's always an asterisk leading to a footnote, and the footnote in this case is fairly considerable. The Nikon 1 cameras will outperform the E-M5 on focus overall. True DSLRs will, to. But not many other cameras can match the E-M5's performance, not even the E-M5's not-so-great continuous autofocus (C-AF). One of the big claims to fame on the E-M5 is the so-called five axis image stabilization, done at the image sensor. The first time I saw that marketing claim I thought perhaps the Olympus engineers had solved String Theory. The "strings" in that theory can exist in ten dimensions, after all (some versions of string theory require 26 dimensions). Apparently a thesaurus isn't a common desktop tool in Japan. What Olympus means is that the sensor-based stabilization of the E-M5 uses five different sensor motions to compensate for camera movement. Those motions would move the sensor up/down, left/right, tilt it up/down, swivel it left/right, and rotate it. One curious aspect of this stabilization system is that, when it is on, the camera hums. Hum isn't a perfect word for the sound. I'm using the word much like when you live near a freeway you can hear the "hum" of traffic. In other words, it's a rather indefinite sound, it's constant, and it's not silence. If you hold the camera up to your ear, it's a bit like white noise, or perhaps the ocean echo from a conch shell. In a quiet room, I can clearly hear the sound several feet away from the camera. Outdoors, I rarely notice it, probably because white noise that low in volume is completely masked by just about any noise as our brain tries to make sense of what it is hearing. Coupled with that hum is a little bit of a ker-chunk sound when the IS system shuts off. As with previous Olympus stabilization systems, you have a choice over the type of stabilization being done, and you can tune the stabilization to focal length if you're using a non-coupled lens. I've actually spent some time testing that latter bit with some non-m4/3 lenses, and it indeed works pretty well, out its max of 300mm (actual focal length). Here's one thing about the stabilization that doesn't seem to get talked about much: Olympus says that manual sensor cleaning by users is a no no. As in don't do it because you can screw up the five-axis stabilization (oh no, Mr. Bill, I've lost an axis and I'm in another dimension now!). Olympus says that if you should ever get anything on the sensor that isn't removed by the anti-dust mechanism, you need to send the camera to them for cleaning. I've had a long-running argument with mirrorless folk, especially the early Olympus Pen users. My contention is that you will eventually have something you need to manually clean off the sensor. Others seem to have 100% faith that everything in the world can be shaken off or that they're always using fast enough apertures where the items on the sensor don't show (yeah, but did that lower the sensor's ability to capture contrast?). Unfortunately, I've now got nearly four years of mirrorless use under my belt and I can tell you: you will get something on your sensor that the shaker doesn't shake. Pollens. Condensation. Heaven help you if you change lenses in misty/rainy environs and even one drop of water gets past the lens mount. The sensor is exposed with the lens off, so all those cocky folk that think they'll never have a dirty sensor are living in a dream world. So I'm going to make a claim here that will upset a few of you: if you buy an E-M5 you're going to need to budget for a trip to Mount Olympus for manufacturer-provided cleaning every once in a blue moon. I've used the word DSLR-like several times so far, and this becomes more obvious the further you explore the E-M5. The menu system is deep and wide, like a DSLR. The additional image quality choices (raw options, Scene modes, Art filters, etc.) are DSLR-like. The shutter is DSLR-like (60 seconds to 1/4000, with a nice 1/250 flash sync). The flash system is DSLR-like in that you can get optional flashes that perform multiple, wireless flash capabilities. The continuous drive is DSLR-like (9 fps with enough buffer to handle several seconds of JPEGs). At a bit less than a pound (15 ounces, 425g), the E-M5 is distinctly not DSLR-like in size or weight, especially if you're comparing it against higher end DSLRs as you probably should be (it slots up nicely against a Nikon D7000 in terms of features/performance, for example). One of the downsides of the E-M5 is handling. One of the upsides of the E-M5 is handling. Well, first off the E-M5 is a bit of Dr. Jekyl and Mr. Hyde in its personality. I've noted before that Olympus needs to do something about its menus, both in naming and in organization, and that's part of the Mr. Hyde aspect of this camera. More so than any other of my main cameras, I keep finding that the menus are a nuisance, not a help. We'll come back to that in a bit, but let me flesh out some of the other Jekyl/Hyde aspects. The E-M5 is a very small camera. In terms of more traditional DSLR-type designs, it's about the smallest you'll find (the Nikon V1 and the NEX-6/7 are more modern EVF-type designs, and handle a little differently due to their non-traditional controls and menus; and even at that, the EM-5 body is about the same size as the Nikon V1). Some people also complain about the small buttons on the E-M5. Yes, they're a little on the small side, but I don't find that to be an issue, even with thin gloves on. Olympus has made most of the buttons such that they're easily found by the fingers and pressed. The one exception might be the Fn1 button, which really needs a bit more size or a bevel of some sort to find and distinguish it. The Jekyl/Hyde nature of design shows up in other aspects, as well. The two command dials (front around the shutter release, the larger rear one towards the back of the body) are not marked. Why? Because they change in what they do. For example, you control the aperture in Aperture-priority mode with the rear dial; in Manual exposure mode you use the front dial. Nikon users will have a particularly difficult time with this if they don't first change the defaults in the menu system, as they're used to a particular function always being controlled by a particular dial, not shifting around like it does on the E-M5 as it comes out of the box. As in their previous mirrorless cameras, Olympus hasn't actually solved the accidental control touch issue, either. Here's how that happens: if you accidentally touch the OK button with the camera active and then accidentally touch any of the arrow buttons, which stick out considerably, in the defaults (and my preferred settings) you can end up changing random settings if you're not careful. The good news is that the camera has to be active for this to happen (some previous Olympus cameras just immediately went into set mode), but touching the OK button puts the camera into active mode and now you're vulnerable to those random settings. Likewise, if you've got focus set to Single Area, touching the arrows when the camera is active moves the focus position in the defaults, something I find that I keep doing accidentally because those buttons stick out a bit; easy to find, but easy to accidentally touch. While these things don't seem like huge issues, they are real issues. A camera should be exactly how you set it and expect it to operate it every time you pick it up, otherwise you lose a bit of spontaneity in shooting. It doesn't happen as often as it did on the Pen cameras, but I still keep finding that the camera isn't quite set the way I thought it was, or the AF point has shifted on me, when I pick up the camera to shoot. As I noted, the E-M5 is very DSLR-like. Mode dial. Command dials. Programmable buttons. A Quick setting mode. Good information in the viewfinder and color LCD (including a live histogram if you want it). The EVF isn't perfect, but it's good. It has good definition that doesn't quickly crumble into a noisy mess in low light, and it has a high refresh rate so it doesn't have that jerky problem that some EVFs do on motion or panning. Overall, it's one of the better EVFs I've encountered, with no bad flaws. However, many polarized sunglasses will make the EVF unusable. Personally, I don't believe in using sunglasses while shooting unless it is absolutely necessary (on glaciers, for example), as it distorts both your contrast and color perception from reality. Some will find the command dials slightly oddly positioned. If you're a one-hander (e.g. try to take pictures with only your right hand in a death clutch on the camera), you're going to find the positions non-optimal. As a long-time Nikon shooter, I find that I'm "reaching" my thumb up and out to find that rear dial; it's not in a perfectly natural position like it is on many cameras. Likewise, the front dial is so close to the rear dial that they overlap a very small amount. That, too, doesn't quite feel right, as it forces your thumb and index fingers into a very narrow position and moves your index finger off the shutter release. Technically, I can get my middle finger on the front dial and leave my index finger on the shutter release, but that feels very, very cramped and awkward. Aside: every time I critique hand position on critical controls on non-Nikon bodies people think I'm being really picky and a total Nikon fan boy. Not really. Here's my personal feeling: your eye should never leave the viewfinder, your index finger should always be on the shutter release, and you shouldn't be moving your right hand around to make settings. Why? Because photos are about moments in time. You want to control the camera fully while still being able to press that shutter release when your eye/brain says "go". Nikon worked with famed Italian designer Giorgetto Giugiaro to get this right many, many years ago, and continues to work with him on new cameras. With most Nikon DSLRs I can keep my eye at the viewfinder, my right thumb on the rear dial, my index finger on the shutter release, my middle finger on the front dial and still grip the camera. Because the pro Nikon's have buttons on the left or lower edge for common functions and use a button+dial setting method, you can literally set almost anything without changing your right hand position or moving your eye from the viewfinder. Canon DSLRs don't work this same way. I've watched many a Canon pro move their index finger in order to set something, and I argue that this makes them slightly less likely to get every moment in time they should. Olympus' implementation of dual dials is even more likely to cause you to move your eye and/or hand, especially since buttons that you might want to push to change something are all on the right side of the camera. There's nothing fan-boyish about my like of Nikon's control positions and my dislike of other cameras' control positions: it's my contention that functionality—getting the shot—is directly attributed to design. Good design gets you there; bad design doesn't. Olympus' design isn't totally bad, but it's not optimal for keeping your eye at the viewfinder and your hand positioned on the shutter release. But don't let me dissuade you from the E-M5 just because of a lot of irritating small traits. Overall, the handling on the E-M5 can be quite DSLR-like and much as you'd expect. You will go nuts trying to figure out how to customize the camera to the way you want it to operate, but once you do, most of that menu haze and nomenclature just goes away and you shoot. And directly control. And shoot. Some people get hung up by things I don't really find all that annoying. For example, the On/Off switch. First, it's a switch, which I prefer over a button. It's indented, so you really have to want to move the switch to move it. But many just don't like the location. Given that the top of the camera is already a bit cluttered with controls and there's a dial already around the shutter release (the place many camera makers put the On/Off switch), Olympus' choice strikes me as a fairly wise one. One thing people are objecting to is having to learn a new habit (moving your thumb down to the switch and up when you pick up the camera to use it). Doesn't bother me at all, and becomes reasonably natural over time. On the other hand, there is a point some make: you can't one-hand the camera and turn it on easily. Thus, when you pull it out of the bag you generally need two hands to turn the camera on. Olympus wisely completely shuts down the camera after a time-out period, so if you leave the switch in the On position, you don't tend to drain battery and you can just press one of the buttons to re-activate it. The EVF/LCD switching also seems to bother some (especially since if you set the camera to have both on, you use battery life and you can't change what's displayed in the EVF, an odd design decision). The automated switch as you bring the camera up to your face is indeed a bit slow; there's a moment when both displays are off for a fraction of a second. But I personally don't find this to be objectionable, and it's not nearly as bad as on some EVF-equipped cameras. Battery: I'm going to go out a bit on a limb here and suggest that I can probably guess how familiar and comfortable you are with your E-M5 based upon how many shots you get per charge. There are plenty of things that can draw power, including the sensor stabilization, the touch screen, and the EVF. Rooting around in the menus trying to find something will keep the camera active for long times, too. Thus, one thing I've noticed is that, as I get more and more comfortable with the camera, my battery life has improved. The CIPA figure is 360 shots per charge, and I struggled to get anything close to that in the early days of using this camera. But as I customized the camera to my liking and stopped menu diving (and thus could turn off the color LCD while using the EVF), suddenly I was right in the ballpark, maybe even a little better, on average. On a good day I get 400+ shots per charge. I've used a number of third party batteries with the E-M5. Some won't charge with the Olympus charger (but they tend to come with their own charger). In practice, I find that most of these batteries don't live up to the BLN-1's capability. I've got two third party batteries that tend to only get 2/3 the shots that the Olympus batteries do. A few others come closer. But none equals the Olympus battery. Bummer. In practice, that's about right. I've used the E-M5 in and around water, in fog, mist, light rain, and snow. While I'm unsure about driving rain (or getting splashed with a wave, or walking under a waterfall), I can vouch for the fact that the camera does tend to be impervious to light, casual water. Of course, that's with all the caps on. Don't lose the hot shoe cap, bottom cap, or the accessory port cap or all bets are off when exposed contacts are present. Generally, if I can keep my glasses free of water and fog, I can keep shooting with the E-M5 with no apparent issues. Olympus conspicuously doesn't state an IP standard for their "splash proofing." This is a little disingenuous, as the IP ratings speak directly to splashing water (IPX4 standard: 10 liters a minute at a pressure of 80-100kPa for a total of five minutes, and from any angle). Suffice it to say that the E-M5 is resistant to casual water splashing against it, if all caps are in place, but we have no guarantee of continuous rejection of water. Also, note that submersion is not something Olympus suggests the E-M5 would survive. As I note, I've had a chance to test the E-M5 in lots of tough, wet conditions, including a week on a boat in misty Alaska and another week of near continuous snowfall in Wyoming. I didn't do anything special to protect the camera, and continued to shoot with it in very challenging conditions. It survived. Autofocus: Olympus' claim is that the E-M5 is the fastest autofocus camera (there are specifics to their claim, such as the lens used). If your subject is static and you're in good light, they're certainly right up there with the best autofocus systems. In those conditions the system is very fast to lock on and very accurate. Even in low light (1/4 second, f/2.8, ISO 200) the system is darned fast, better than many DSLRs. I tend to not quibble on small differences, and I don't believe that any review site has managed to come up with a repeatable, reliable test that can provide numerical comparisons that are accurate. Thus, my conclusion for single servo focus in reasonable conditions is that the E-M5 is DSLR-like, and towards the top of that DSLR heap. In low light single focus on static subject tests, the E-M5 beats my D3200 pretty much every time. Go one more step and try to track focus with continuous shooting and everything completely falls apart. More often than not I see back focus in numerous continuous shooting sessions, meaning that the camera is losing the subject and finding the background to lock onto. Note also that at 9 fps, focus is fixed at the point of the first frame, despite the camera pretending to try to track focus during the sequence. All of which makes the E-M5 a great static shooter but not so great as an action shooter. Not that you can't find techniques to help you get in-focus action, but you can't trust the camera in those situations: you need to step in and help. Always. Stabilization: While I've yet to occupy the world in which there are five axes yet—string theory gives me hope—there's no doubting that the built-in sensor stabilization on the E-M5 is usually very effective. I say usually for a couple of reasons. First, you do have to make sure that you're not mis-setting it, especially if you're going in and making manual changes to focal length to accommodate a lens via adapter and then forgetting to reset the system. I've done that a few times, and it's not pretty. If you want to see what this looks like exaggerated, put the 18mm lens cap on the E-M5 and set IS to 300mm. It's a cardinal sin to not have focal length match focal length: you will get bad results if you manage to make this mistake (normally IS is set automatically via lens/camera communication, so it's not likely you'll make this mistake with, say, the kit lens). Some people refer to this last bit as "shutter shock," implying that the shutter is the culprit. I suppose that's possible, but the shutter doesn't always cause a problem at a given shutter speed and focal length. I have sequences with the same settings in the same conditions where several shots are correctly stabilized and one is not. Most often cited are shutter speeds in the 1/4 to 1/100 range, though I've seen people report (and I've experienced) the same problem at slightly higher shutter speeds. To me, this is an indictment of the IS system itself: it's not correcting (or overcorrecting) certain motions under certain conditions. IS is not something I believe should be left on permanently. On the E-M5 that's a trickier thing, though, as the sensor is essentially gimbaled (not fixed in position) and it's not clear that it's always in a perfect alignment position and completely still when IS is off. JPEGs: Olympus JPEGs have long been loved by many, almost to the point of worship. Like Fujifilm, Olympus has their own secret sauce that emphasizes saturation, contrast, and some color shifts over neutrality. JPEGs out of the E-M5 are amongst the most contrasty I've seen at defaults (and you can dial that up if you want). When the first images started coming off the early E-M5s, several of us who are deep into the pixel data spent time analyzing what Olympus was doing. It actually gets fairly tricky to figure out, as there are lot of intersecting things going on. If you set "Gradation" to "Auto" for instance, you're going to see one of the uglier aspects of Olympus' processing. In this mode Olympus breaks the exposure data up into bands, and then processes each band a little differently. Unfortunately, the deep shadow band is given an extra boost and noise (or the noise reduction processing effects) becomes highly visible, even in the Natural Picture Mode. Olympus gives you quite a bit of flexibility in tailoring your JPEGs, including a series of special modes like Grainy Film and Cross Process. For JPEG shooters, that's great, but you're going to need to take a great deal of time to learn what all your options do and figure out when and how you want to use them. I tend to find that the default Natural, without any of the enhancements, produces decently punchy results that are visually pleasing. Raw files: One of the things I keep hearing is that the E-M5 is as good as the best APS/DX sensors. No, not quite. The E-M5 lags a bit compared to my D7000 (both 16mp cameras, one m4/3 and one DX, both using Sony sensor technology). One of the tricks Olympus is using has to do with how they position ISO values. At ISO 200, for instance, the E-M5 is actually about two-thirds of a stop behind the D7000. So one has to be careful when talking about data measurements at marked ISO values. DXOMark actually rates the E-M5 and D7000 a bit further apart than I tend to find them in actual shooting. Of course, I tend to be mostly a landscape and travel photographer with this type of camera, so I'm not generally pushing into the high ISO values. And then there's this: there isn't a 16mm focal length option on the D7000 that's as good as the 12mm options on the E-M5. 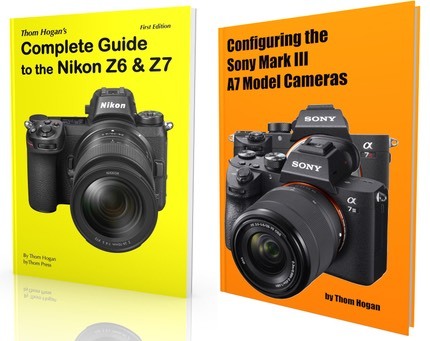 If you happened to read my bythom site during DX Month last October, you know that I've faulted Nikon for making great cameras and then not backing them with enough good lenses. The E-M5 does not have that problem. Olympus knows how to make great lenses, especially those primes like the 12mm, 45mm, and 75mm set. Raw shooters are looking at maximizing all aspects of their data capture (that's what we digital photographers do: capture data), and the combination of a very good sensor that's highly optimized coupled with great lenses makes for a very good capture quality. What I've discovered over the year of using the E-M5 is that shooting raw and learning what the camera can and can't do, I'm rarely hampered by image quality issues. At base ISO there's plenty of dynamic range (see image below). Even up to ISO 3200 there's still good recoverable detail in the shadows if you process carefully. This was a tough review to write. Indeed, it's taken me longer than it should have because there have been a series of small things that I wanted to be sure of before committing to them on the site. For a serious, disciplined photographer who is willing to spend some time getting to know this camera and figure out where Olympus has hidden all the settings you might want to change, the E-M5 is a contender. A contender that holds its own against most bigger APS/DX DSLRs in all but one area: continuous autofocus. So there are a few questions you need to ask yourself before you jump on board the E-M5 wagon: Are you willing to spend some time learning and optimizing this camera? Can you really live without good tracking of fast moving objects and continuous autofocus? Are you willing to start building a new system, with new lenses, accessories, and batteries? If your answer to those question are all "yes", then the E-M5 is a tough camera to beat. Well built, well specified, excellent images, and good consistent performance in all those other areas. It's become one of my goto cameras, and rarely am I on a trip where it isn't with me. Given it's small size and weight, it would be a really tough trip where it didn't come along. NEX-7 — While the Sony has 24mp, it doesn't yet have the lenses to make those extra pixels shine. At least not many of them (basically 24mm, 35mm, and 50mm at the moment). The aggressively modern style can be as annoying to some as the E-M5's menus, and Sony's menus aren't any help, either. The E-M5 focuses faster. The E-M5's JPEGs are visually more compelling. The NEX-7 is smaller, and if you like the modern UI, handles just as well. While I think the NEX-7 is a very good camera, ultimately it's let down by lenses right now. In some ways, the NEX-6 is closer to an E-M5 competitor, as its 16mp sensor matches the Olympus in count and is a better match to the existing E-mount lens set. Moreover, the NEX-6 is a little less modern than the NEX-7. But still, I can't see me picking either NEX over my E-M5 at the moment. Right now, my choice for landscape work would go: E-M5, X-E1, NEX-7, in that order. For travel work, the NEX-7 would be closer to the X-E1 due to the additional lens choices right now, but I think it would probably still be the same order for me. For action work, ugh. I might be tempted to go with the X-Pro1 in optical view and manually or zone focus. For carrying around all the time, the E-M5 and NEX-7 can travel very small with a nice collapsible zoom, but the X-E1 would be burdened by a far larger zoom lens (though in fairness that lens would be faster in aperture). If any of these cameras were my only choice, I wouldn't be unhappy. But with all the choices available, right now my pick is the E-M5. For you? Well, these cameras are fairly close in capability. None are bad in image quality, and the tangible differences can be small if you're shooting raw. So here's my suggestion: try them all at the store. One will feel more comfortable to you. If you're a JPEG shooter, set them all to their most natural setting (typically the default) and shoot something complex and colorful, then go home with that card and evaluate them. Finally, check two things: the focus speed for the types of shooting you'll do, and the lenses available now and in the near future (remember, on the main page for each company in the lens section of this site I list known future lenses and lens road maps). Those are the elements you should probably make your primary decision on: ergonomics, JPEG quality, focus performance, and lens availability. Which brings us back to the E-M5. Lens availability is tops. Focus performance for static subjects is top of class. JPEG quality is proven good and visually compelling, especially at lower ISO values. Meaning that the only category where I feel the E-M5 can lose the vote is in how you like the controls and menus. As I noted earlier, this isn't a camera you just pick up and everything's perfect. If you're the impatient type, the E-M5 might not be the camera for you (try the X-E1, which is simple and intuitive in this respect, at least for seasoned photographers). But there's a reward for spending time decoding the manual and decrypting the strange terminology and studying the options: the E-M5 is highly configurable. 2018: this model is out of production and no longer available new. But used copies can easily be found. Also look at a current model, which would be the E-M5m2.